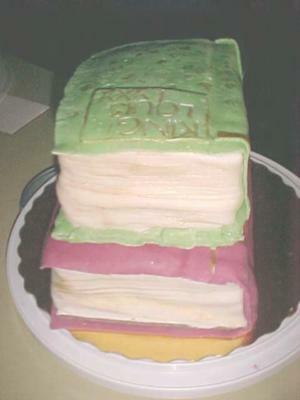 My cousin wanted a book cake for her husband that reads a lot. I made two 9 x 13 cakes. They were white cake and lemon filling. I cut each of them in half and stacked them. I buttercreamed each separately and then put the fondant on. I wrote on the top one in gold. His name is Louis, so I put King Louis LXXX which is Eighty in Roman numerals. that is the age he just turned. It was a very hot 110 Degree day and my fondant was cracking on me. Nancy, I understand as a cake decorator we are hard on ourselves but your cake come out beautifully. It looks just like a book. They you shaped the fondant to look like pages were awesome. GREAT JOB! as all always. This cake looks really good. Very creative with the roman numerals too! I am sure he loved it. You always do a great job!!!!!!! !